[ Scoresby Routledge, ethnographer and anthropologist. ] Typed copy the 'Will of William Scoresby Routledge Esq. ', made out for his executor and trustee J. C. D. Harington, with Typed Letter Sgned to Harington from solicitor Norman C. Hurst. Will by Stapley & Hurst, Eastbourne; dated 27 January 1938. TLS from Hurst to Harington on the firm's letterhead, Westminster Bank Chambers, Eastbourne; 17 July 1947. ONE: Typed copy of will. 3pp., 4to., on three leaves. In fair condition, worn and aged. Folded into the customary packet, with the details typed on the reverse of a fourth leaf. The four leaves held together with a brass stud. Routledge ('formerly of “Ewers” Old Bursledon in the County of Southampton but now of Tjiklos Kyrenia in the island of Cyprus') declares: 'I was born at Melbourne in the year 1859. My father brought me to England at an early age. I was educated at Christ Church Oxford and studied at University College Hospital. [ William Scoresby Routledge, ethnographer and anthropologist. ] 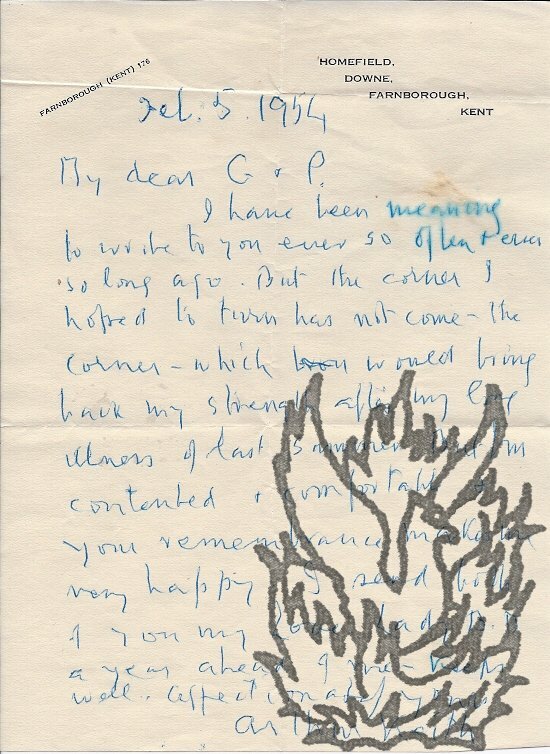 Final two pages of Autograph Letter, with signature 'W. Scoresby Routledge'. On letterhead of the Conservative Club, St James's Street, S.W. [ London ] No date. 2pp., 12mo. Bifolium. In fair condition, lightly aged and worn. The text reads: '[...] dont think you are giving trouble - | Would you like me to secure you a smart little single handed boat - an ideal boat for sailing about the river with a lady? | Or is it not worth while from the point of view that your wife will not like you going on the water & taking her | Yours Ever | W. Scoresby Routledge'. From the papers of Sir Richard Harington (1861-1931) of Ridlington, 12th Baronet, who was at Christ Church, Oxford, with Routledge. [ Edmond-Frédéric Le Blant, archaeologist. ] Autograph Letter Signed ('Edmond Le Blant'), in French, to an unnamed recipient, discussing the practice of cremation, and listing periodicals to which he contributes. 'Paris, rue Leroux, no 7'. 14 May 1874. 3pp., 12mo. Bifolium. In fair condition, on aged paper with some wear at bottom edge. Addressed 'Monsieur'. After a reference to a newspaper article by the recipient and 'les journalistes Français', he communicates, on the subject of cremation, 'un fait que j'ai appris hier du rédacteur en chef d'un grand journal Suisse et qui n'a pas été rendu public par les gazettes', concerning an attack on those attempting a cremation in Berne. 3pp., 4to. Fair, on lightly-aged paper, with slight smudging to outer margins of both leaves. Addressed to 'My dear Jack'. He is pleased to have heard from Driberg, but disappointed that there is 'no immediate chance' of seeing him, as he has not 'strayed from home for moons. 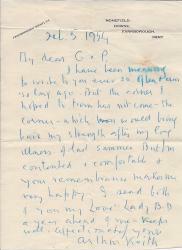 Autograph Letter Signed ('Christopher Sykes') from the author and aesthete Christopher Hugh Sykes to the social anthropologist J. H. Driberg, arranging a meeting in Cambridge. On letterhead of Badlingham Manor, Chippenham, Ely, Cambridgeshire. Undated [late 1930s]. 2pp., 12mo. Very good on blue paper, with letterhead printed in red. He begins: 'I must write to tell you how very much indeed I enjoyed the course at Cambridge and particularly your lectures.